our penetration testing verified your opinion. The barnes bullets didn't do real well. Very little expansion but great penetration. Even up close (50yards) we had bullets that failed to expand or expanded little. At a 100 yards it got much worse. Ive even seen the same in 25 cal barnes bullets in the 257 roberts, 2506 and every the 257 wby. We spent a whole crop damage deer season using 25 cal barnes bullets and chased more deer that year then weve chased in all the other years combined. Now step up to the 7 mag or the 300 mags and things change. that's were the copper bullets shine. You couldn't pay me to use a 223 on live animals with a solid copper bullet. Partitions and bonded bullets are definitely superior in the 22cal guns if you want to use them for what they weren't intended to do. I started out my oldest daughter with the .223 for mule deer in South Dakota. She shot my heavy barrel Savage rifle from crossed sticks for stability. We found the 64 grain soft tip loading by Winchester to be quite lethal producing one shot kills at distances out to approx 125 yards or so. The bullets always passed completely through the chest organs and out the other side. Great performance for such a small caliber! My daughter decided that she liked my 30-30 Glenfield carbine better so at age 17 she made the switch to a lever action. We both favor its short length and light weight for hunting in rough country. Which Barnes bullets are these that are failing? 80 and 100 grain x blue plastic tipped. About 5 years ago my buddy and I did some penetration testing with ar15s using a bunch of different bullets looking for a good dear load. I don't remember all the different bullets we tested but it was at least a dozen. Star of the show by a long shot was the 60 grain partition. Most of the others either fragmented after about no penetration or in the case of the barnes bullets penciled in and left a very small wound channel. About half of them didn't even expand. We were shooting through 3/8s plywood to mimic bone in front of wet print. We shot each bullet 5 times. Some bullets like the 64 grain Winchester and the 60 grain bt would do well maybe half the time and fail miserably the other half. ONLY consistant performing bullet was the partition. Now that said at the time there were no bonded bullets. Id about bet some of those would work too. I took out one of my ars and shot a half a dozen deer with the partition at 100-300 yards and it just wasn't impressive. Yes it killed them but most ran off and died. Tracking deer when they leave those fields is tough. Its either elephant grass or swamp. Didn't loose any but wouldn't do it again. Had about the same results with the x bullets in the 24 and 25 cals. Most times with those smaller bores theres not much of a blood trail even with a good hit and id take the massive internal damage from a cup and core bullet over a tiny exit wound and small wound channel from an x bullet. Like ive said step up to the 7mms and 30s and its a different story. In .224, isn’t the heaviest TTSX bullet 62 grains? Well over the years I have taken at least fifteen deer with the 223/5.56. Mostly I have used either the 60 gr. Hornady HP flat base bullet or the SP version of the same bullet. Most were DRT with neck hits in front of the shoulder. The rest were rib cage hits just under the shoulder blade tight behind the shoulder. Some of these ran a few yards. I wouldn't count on an exit but a few did exit. If I were to shoot another deer with a 223 I would probably use the 70 gr. Speer or the 75 gr. BTHP with cannelure from Hornady. I have used these two on a number of feral hogs, lost a few but I don't take the time always to precisely place the bullet on hogs as half the time I am just trying to reduce their number and not expecting to put them in the freezer. But over all they have Performed well enough. 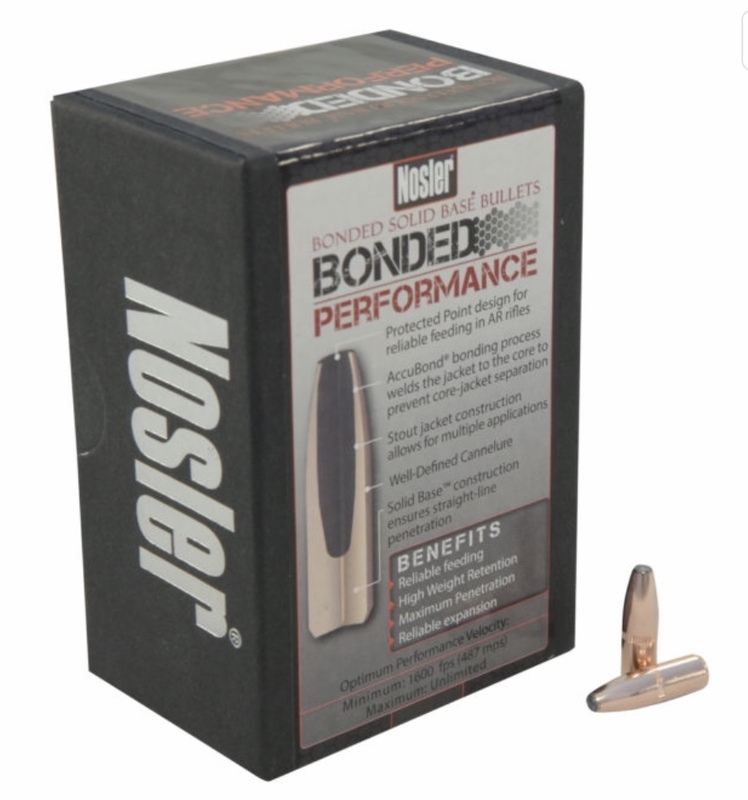 Nosler Bonded Performance Bullets 22 Caliber (224 Diameter) 64 Grain Protected Point Solid Base. Proven performer on deer and hogs.